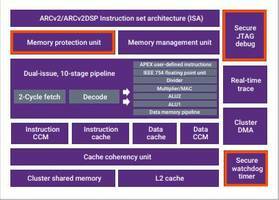 Synopsys, Inc. (Nasdaq: SNPS) today announced the new Enhanced Security Package for Synopsys DesignWare® ARC® HS Processors, enabling designers to develop isolated, secure environments that help protect embedded systems and software from evolving threats in high-end automotive, storage, and gateway applications. The Enhanced Security Package incorporates a range of features, including integrity protection, multiple privilege levels, and a watchdog timer that help protect system-on-chips (SoCs) against both logical and physical attacks, such as IP theft and remote attacks, without compromising performance. ARC HS Processors with the Enhanced Security Package enable SoC developers to create devices less susceptible to security threats while eliminating the increased area and power consumption that an additional security core and associated memories would impose. The Enhanced Security Package option for ARC HS Processors is available now. Power SMT Packages feature fully hermetic design. Remtec Has Developed Innovative Flip Chip Packaging for Faster Speed Switching Power Devices.